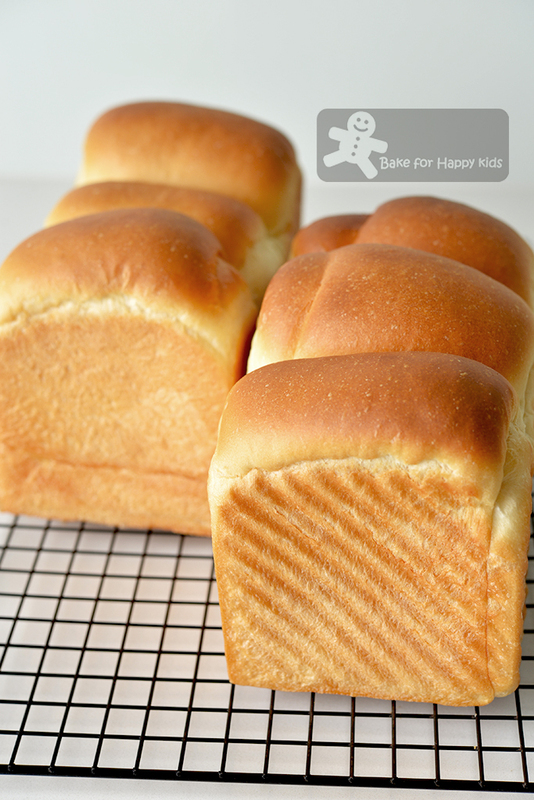 Bake for Happy Kids: QQ Soft Egg White and Cream Sandwich Bread - with NO added water or milk! A MUST TRY Interesting recipe! QQ Soft Egg White and Cream Sandwich Bread - with NO added water or milk! A MUST TRY Interesting recipe! When the Chinese New Year is arriving and has celebrated, I always have tubs and tubs of frozen leftover egg whites in my freezer! Do you have heaps of leftover egg whites in the freezer after baking heaps of many yolks-rich goodies like pineapple tarts, cookies and cake lapis? Or these QQ Soft Egg White and Cream Sandwich Breads!!! 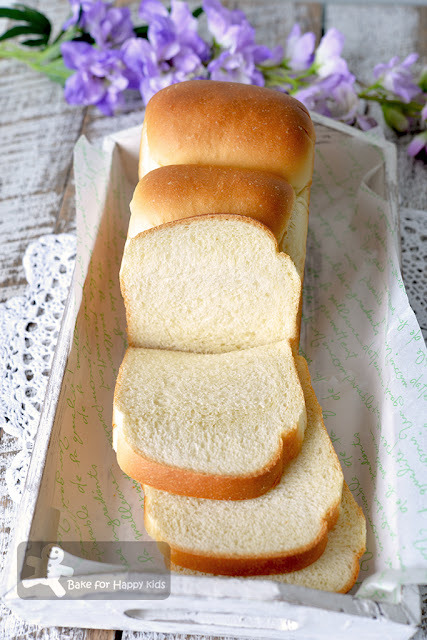 After baking countless bread recipes at here, I must say this egg white bread recipe is one of the most INTERESTING bread recipes that I have ever came across and baked. Unlike most bread recipes, these are not made of water or milk!!! Instead, the liquid components of the recipe are primarily egg whites and cream! That's it!!! In fact, the added cream has provided the breads sufficient fat content to make them soft and delicious. Hence, the addition of oil or butter is not required. With no added water or milk, the bread dough is unusually firm and not sticky to handle. And I don't even need any flour for dusting and shaping! It is so amazingly easy to handle!!! Best of all, these egg white breads made from firm bread dough are surprisingly soft!!! Although they are not exactly super soft like the ones at here, here, here and here, they are deliciously bouncy QQ* soft with a nice rich milky taste. Let me guess... Are you curious? You want to try baking this recipe? I was! I tried baking these breads. And I love them!!! I would say that it is definitely worthwhile exploring this MUST-TRY recipe especially if you like baking interesting bread recipes and also when you have lots of spare egg white to use! ... that is made with NO added water or milk! Very interesting! I have mentioned before at here that the enzymes in non-heat-treated milk can break down gluten and prevent the bread dough from rising. So likewise, the non-heat-treated cream in the bread dough will act the same too. Thus, you will see in my video that this cream bread dough will not rise as much as the dough that are made with scalded milk or water plus milk powder. Yet, the added egg white will help the breads to rise beautifully after baking. Isn't this cream and egg white combination in bread simply amazing? 1) the firm bread dough is very easy to handle and I don't need any flour for dusting and shaping! 2) the dough won't rise much during proving but will rise beautifully well after baking. 3) I don't need to apply any egg wash on the breads and yet they are so nicely baked with a perfect golden brown crust. 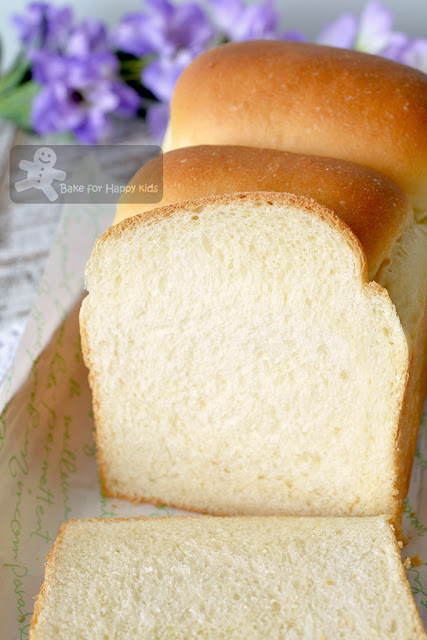 4) the firm non-sticky bread dough can bake such soft milky breads! Nice sandwich breads with a perfect golden brown crust! I'm impressed with this recipe! Are you? I reckon this beautiful bread photo says that it is definitely worthwhile exploring this recipe! Agree? If you like my blog and recipes, please support me! I'm an everyday working mum and need lots of motivation to bake and share!!! And it will be nice if you can LIKE, SHARE and FOLLOW me at either my Facebook at here or here or my Instagram @zoebakeforhappykids Thank you! The original recipe came from a Chinese baking book but the health conscious me has reduced the added sugar by 50% and modified the recipe quite a lot according to my preferences. And it works beautifully!!! Note: You can use half of this amount to bake just one loaf. 240g egg white, at room temperature (not cold!!! ), about 7 egg whites but please use exact weight! WARNING: This bread dough can be tough and firm to handle at the beginning of kneading and it will be good if you can use a breadmaker or an electric mixer with hook attachment for kneading. If you are using a breadmaker to knead and prove, add all ingredients into the breadmaker according to this order. Use "dough" setting to mix and knead dough for 30 mins or until the dough is smooth and elastic. Allow the dough to prove for 60 mins. If you are using an electric mixer with an hook attachment to knead, combine all ingredients in the mixing bowl. Use a spatula to mix all until mixture forms a dough. Then, use the electric mixer to knead at low speed for at least 25 mins or until the dough is smooth and elastic. It is important that the dough has to be smooth and well-kneaded. Cover the dough and allow the dough to prove in a warm and humid place for about 60 mins or until doubled in size. NOTE: This bread dough is very easy to handle and extra flour is not required for dusting and shaping. Grease loaf pans with oil or cooking oil spray. Divide dough into into 6 equal portions (about 210g each). Shape all portions of dough into smooth balls. Allow them to rest at room temperature for about 10 mins. Using a rolling pin, roll each portion into long and flat oval shape (about 20 cm) on a non-stick surface. Use your fingers to pick one shorter side of the dough and tuck and roll the dough like a Swiss roll. Use the rolling pin to flatten and roll the dough into a long rod shape. Then, pick one shorter side of the dough and roll it like a Swiss roll again. Repeat this rolling step with the remaining portions of dough. Place three rolled dough with their seams side down into the each prepared pan. Press the top of the dough lightly to form an even surface. Allow the dough to prove in a warm and humid place for another 60-75 mins or until it reaches about 2 cm from the maximum height of the loaf pan. NOTE: This bread dough with non-heat-treated cream won't rise usually well during proving but the added egg white will help them to rise beautifully well after baking. Bake breads in a preheated 180°C (350°F) oven for 25 mins or until the breads are thoroughly baked inside. If the top of breads turns brown too quickly, cover the breads loosely with a foil after 15 mins of baking and continue to bake for at least 25 mins in total. Transfer bread immediately onto a wire rack and allow it to cool completely. Slice and serve. Oh wow that bread looks so soft! I usually end up with left over yolks. I sometimes bake pavlovas for orders so end up with the yolks.